Last Saturday our downstairs neighbors became too much to bear. Since their bender showed no signs of slowing down after 14 hours, we decided to hit the streets and visit some long-postponed exhibitions.First stop, the Centro Cultural GAM. When I was living here a few years ago an arson did the world a favor by forcing officials to shroud this truly ugly building, so it never held a place in my mental map of the city. Now the building is an incredibly useful public space (free Wi-Fi; clean bathrooms) with loads of exhibition nooks. I spent 90 minutes in the third-floor library space, perusing Clip/Stamp/Fold: La arquitectura radical de las ‘Little Magazines’ 196X-197X [aka Clip/Stamp/Fold: The Radical Architecture of Little Magazines 196X-197X]. 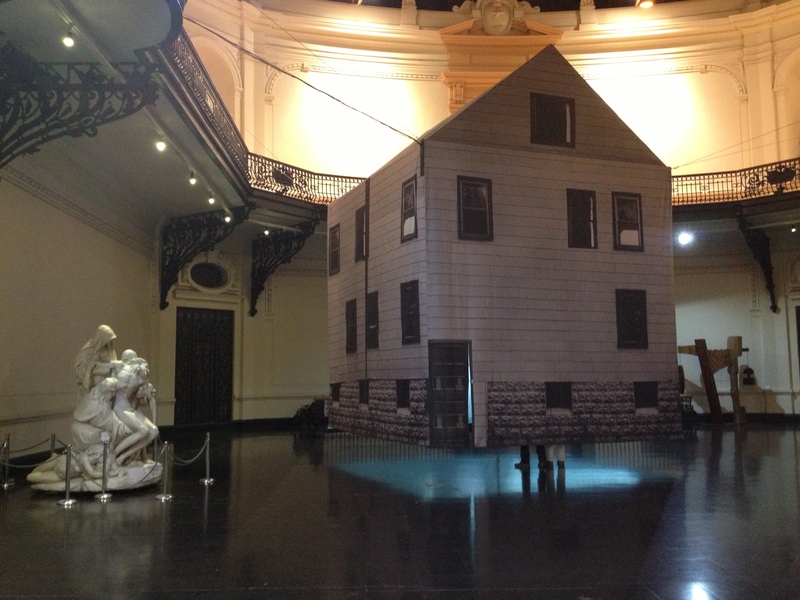 We had a 4pm date at the Museo Nacional de Bellas Artes to watch a series of films regarding Gordon Matta-Clark, in relation to the current exhibition. I caught a retrospective on Matta-Clark in the basement of the MNBA only a few years ago, so I wasn’t sure what this show would contribute. 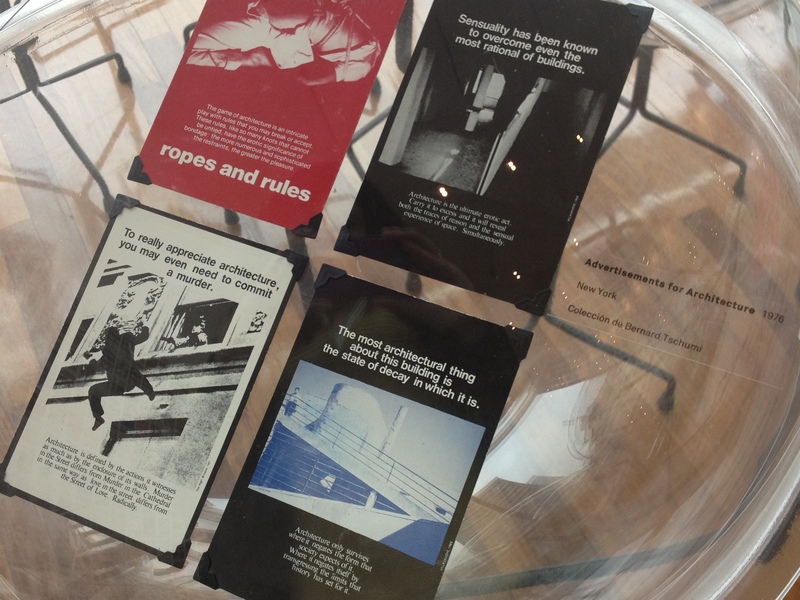 The gallery space itself is small, which lends itself to the video-heavy nature of the exhibition. Most of the time with Matta-Clark there seems to be a bounty of photos so it was nice to watch interviews with his colleagues and intimates. 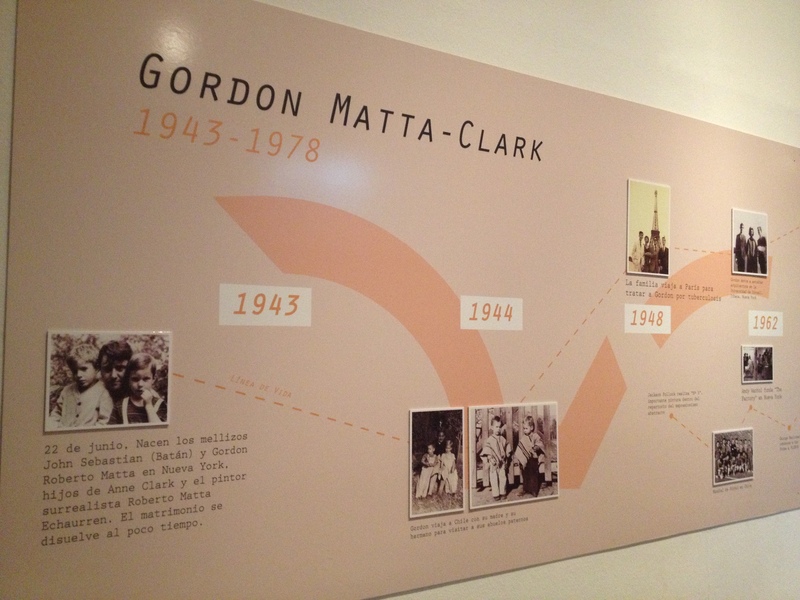 I also found the chronology interesting since it makes the case for Matta-Clark’s Chilean identity; ever so subtly of course, blink and you’ll miss the photo of the Matta twins dressed as huasos. Matta-Clark is very much in fashion, as art historians and architectural historians clamor to claim him. He also exists in that nebulous space of the contemporary creative type that floats above national designations, like Alfredo Jaar. Within Chile, one thing is beyond debate: his father, the Matta, is Chilean even if he belongs to that nebulous crowd of Surrealists who roamed between Europe and the Northern Americas before and after World War II. I do not think anyone is trying to make Matta’s son Chilean: he was born in the U.S., worked and gained fame there, and is considered an American artist. 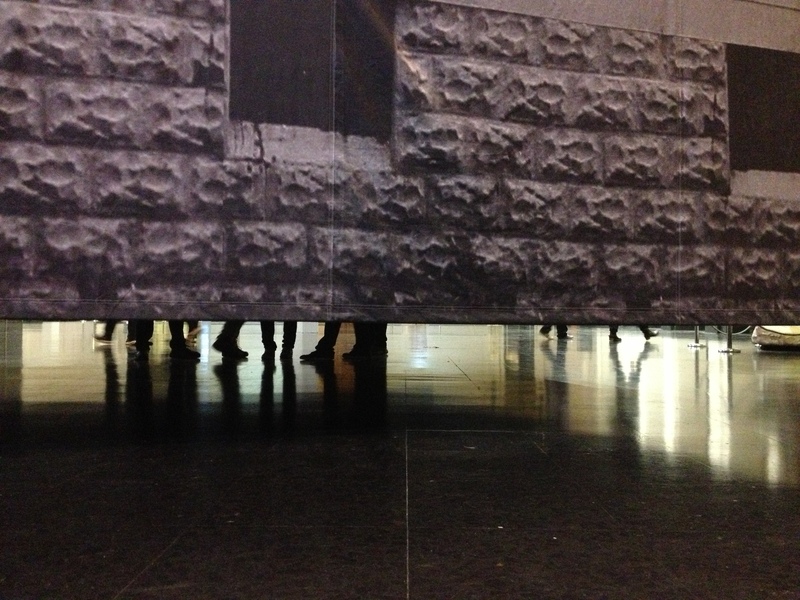 Yet one cannot ignore Matta-Clark’s pedigree and the task of reconciling this is made easier with each exhibition. 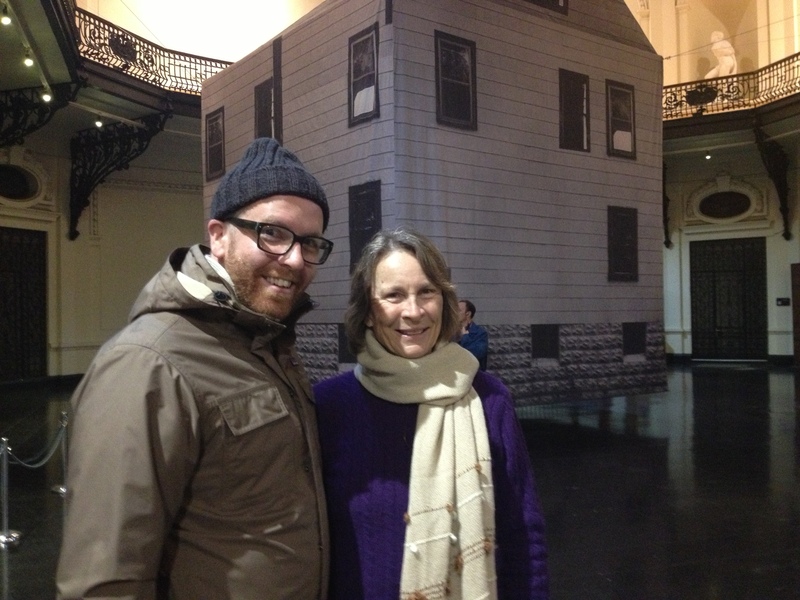 And of course, there was the floating house, perhaps one of the coolest video projection spaces I have ever encountered. Once we had our fill inside the house-tent, we went into the screening room to watch the films. I had never seen Food (1972) all the way through and I appreciated viewing it in its entirety in this setting. Afterwards we had a lively Q and A with Carol Goodden. Lucky for me, I came with a chef and amazingly, Patrick and Carol hit it off. Hopefully next time she is in our neck of the woods he can cook for her.